Always the consummate journalist, Janet Yuen-Mei Wu has been NewsCenter5 state house reporter for WCVB-TV since January 1983. Janet is also part of WCVB’s investigative unit. Always the consummate journalist, Janet Yuen-Mei Wu has been NewsCenter5 state house reporter for WCVB-TV since January 1983. 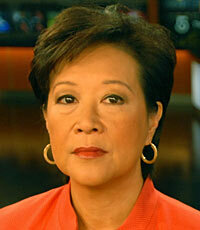 Janet is also part of WCVB’s investigative unit. And since October 2009, she has also teamed with NewsCenter5 Anchor Ed Harding to co-host On The Record, a weekly roundtable discussion of Massachusetts politics airing each Sunday morning Janet is a key member of WCVB’s political unit and was a member of the team honored in 2001 and 2005 with the coveted Walter Cronkite Award for Excellence in Political Journalism. A guest speaker or panelist at many community events, she was featured at the 2009 media conference sponsored by the Asian-American Journalists Association. This year, she is serving as an honorary co-chair of the Silk Road Gala, which raises funds for the Asian Task Force Against Domestic Violence. Before coming to Channel 5, Janet was the State House reporter for WGBH-TV, Boston’s public television station. Prior to that, she worked as a reporter for United Press International. A native of Bridgewater, N.J.; she received her bachelor’s degree from the University of Michigan at Ann Arbor.